FIFA’s chief has been suspended for eight years, but the drama is just beginning. When Al Capone was arrested and convicted on tax-evasion charges, a message was sent: If you have to run a criminal cartel that produces acres of corpses, then so be it, but the government had better wet its whistle too. Sepp Blatter, the Scarface of international soccer who has been president of FIFA since 1998, was suspended for eight years on Monday by his own kangaroo-court ethics committee, and a similar message was sent: Coddle dictators, turn the other way as hundreds of migrant workers die in the Qatari heat, bribe whoever needs to be bribed, but by all means, you better hold on to those damn receipts. This kind of like reasoning that the CEO of Chipotle’s only error was not classifying E. coli as an optional burrito topping. 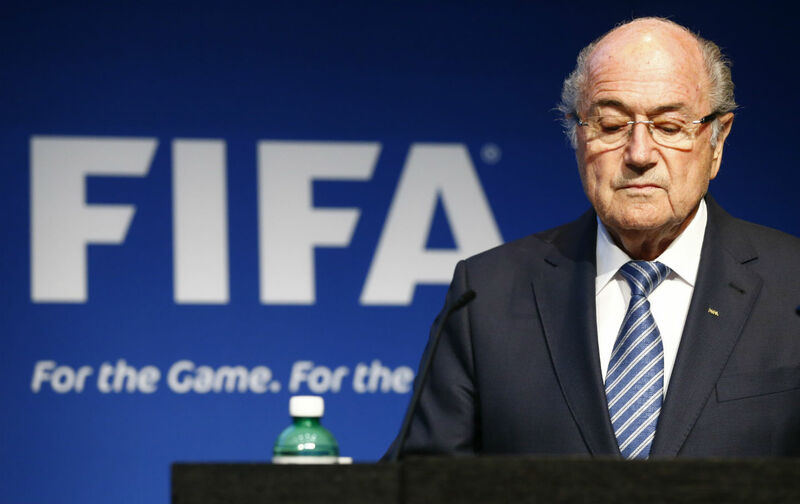 But “shame” or “contrition” have never been a part of the Blatter lexicon. “Appeal” and “martyrdom,” however, most certainly are. This is because the eight-year suspension has particular pain for Blatter, and not merely because at age 79, eight years could separate him from the federation until he enters that last luxury box: the one with the velvet interior. Blatter was hoping to hang on until February, when a new FIFA President is due to be elected and Sepp was hoping for a lucrative and powerful “president emeritus” post. For Platini, who is 60, the sanction also takes him out of the running at the February conference where he was hoping to be the new man on the throne. The onetime star player has kept a low profile throughout the ethics investigation, choosing to not attend his own hearing, deriding the committee as politically motivated and illegitimate. “I am already judged, I am already condemned,” he said. It’s understandable also why Platini doesn’t want to press his luck. He gets to keep the $2 million, and only has to pay a fine of 74,000 euros. That is what we would call a sweet deal. One part of Blatter’s press conference that had an undeniable certain ring of truth—when he said, “If we had awarded the World Cup in 2022 to the USA, we would not be here.” It is certainly difficult to imagine newly appointed Attorney General Loretta Lynch targeting FIFA for money laundering, wire fraud, international racketeering, and 150 million dollars in bribes if the USA had been awarded the 2022 World Cup over Qatar. But that does not change the open graft with minimal oversight that has defined the Blatter era. It does not change the debt, displacement, and militarization that FIFA has brought to countries wanting the financial and political allure of hosting international soccer tournaments. It above all else does not change or excuse the reality that 1,200 migrant workers have died in Qatar as the World Cup nears. Both FIFA and the Qatari government have attempted to obfuscate this figure by saying that not one death is related to World Cup facilities and instead are connected to other construction projects. Leaving aside the moral bankruptcy of this statement, it ignores that all the infrastructure projects of Qatar, a country made up of about 270,000 citizens and 1.5 million migrant workers, are part of Operation World Cup. As always, the demands for development far beyond “FIFA Quality Stadiums” was a part of the deal driven by FIFA. I wish Blatter was being put on trial for these deaths. I wish he even felt the moral compunction, while blathering on about Mandela, to even address the existence of such carnage. But instead we got what Blatter is best at: hogwash. The fact that this vintage of Sepp hogwash was in response to the penalties imposed by his own hogwash committee, doesn’t make the existence of some accountability any less welcome for a man who has chosen to take a beautiful game and use it as part battering ram, part open cash register.